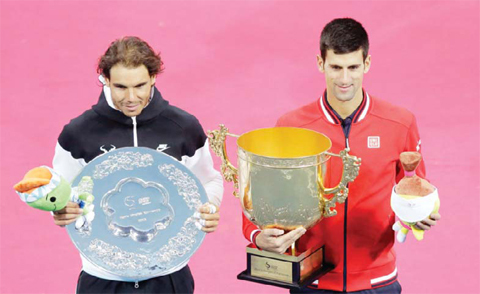 BEIJING: World number one Novak Djokovic continued his recent dominance over Rafa Nadal when he beat the Spaniard in the final of the China Open to win the tournament for the sixth time yesterday. The Serbian showed no mercy against the Spaniard, who was hampered by a foot problem in the second set, as he cruised to a 6-2 6-2 victory at the National Tennis Centre in the Chinese capital. “I played a great tournament overall and continued playing well today,” Djokovic said at the trophy presentation. “This definitely has been my most successful tournament in my career. I have won the Australian Open five times but Beijing has been a lucky place for me. “I keep on coming back here and have very positive memories.” Djokovic has now beaten Nadal in seven of their last eight meetings, dating back to the 2013 China Open, and is on the verge of levelling their head-to-head record. The pair have played each other 45 times with Nadal, who has struggled with his form and niggling injuries in the past year, hanging on to a 23-22 advantage. The world number eight took a medical timeout early in the second set when he hurt his right ankle but continued on, despite appearing to be in discomfort. “I hope Rafa’s foot is fine and he’s able to play next week (in Shanghai),” Djokovic said. “It’s always a pleasure to play against him on a big stage. “We’ve played, I think 45 times against each other and we keep on going. Hopefully, we can have many more encounters.” Djokovic was already well on top and in complete control when Nadal hurt his foot.